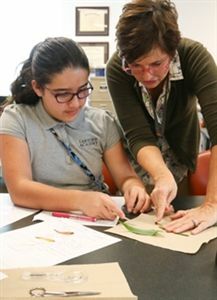 The Annual Fund empowers Lakeview Academy to expand what is possible. It bridges the gap between an excellent education and an extraordinary education by ensuring that every year, every student benefits from experiences above and beyond what can be provided by tuition alone. 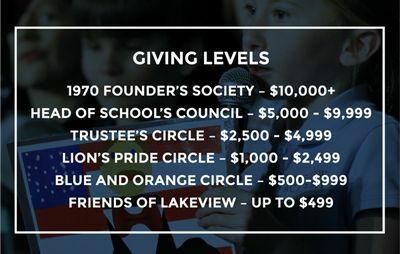 With your unrestricted gift to the Annual Fund there is no limit to what Lakeview can achieve. go beyond the limits of what tuition can afford. We believe the students are worth the investment. Let’s go all in to reach our goal of $250,000 in unrestricted gifts. It’s our job as a family to support our school through charitable giving. If we all come together, we can collectively take our school to new heights. A: The Annual Fund empowers Lakeview Academy to expand what is possible. It bridges the gap between an excellent education and an extraordinary education by ensuring that every year, every student benefits from experiences above and beyond what can be provided by tuition alone. With your unrestricted gift to the Annual Fund there is no limit to what Lakeview can achieve. Q: Where does money from the Annual Fund go? Q: Why is participation so important? A: High participation in our Annual Fund by the Board of Trustees, Faculty and Staff, and our parents is a positive sign that families are invested in their children’s future and support the mission of Lakeview Academy. The participation percentage can have an impact on outside sources such as grants from area corporations and foundations. Q: When can I make a pledge or gift? A: A gift to the Annual Fund is 100% tax deductible and coincides with our fiscal year, July 1 – June 30th. However, our parents are encouraged to make a gift or pledge during the months of November and December each year. A: The goal for the 2018-2019 Annual Fund is $250,000 in unrestricted dollars. The Faculty/Staff have already reached 100% participation. We would love to increase our parent participation from 32% to 40% this year. Thank you and feel free to contact me anytime.